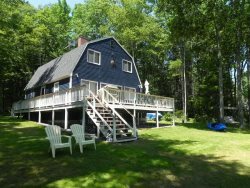 Considering listing your Mid-coast Maine home for rental? Newcastle Vacation Rentals is a rental agency and not a property management company—we work collaboratively with Owners. We offer support and assistance with issues that occur while a renter is in residence. We depend on the Owners to have a good maintenance team in place and to ensure the property is well prepared for the season. If we list your property, we'll prepare detailed information about your property and location, create an archive of photos, and develop your properties webpage. As a rental agency, our office provides individual assistance to clients in the selection of an appropriate property.